My absolute favorite sabermetrical tool on the Internet is FanGraphs' win probability graph. 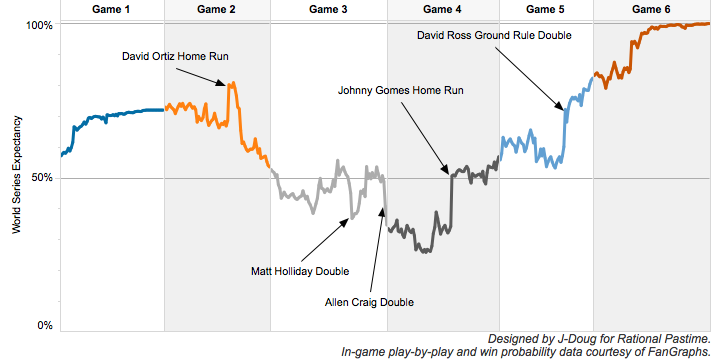 Based on Tom Tango's win expectancy calculations, each graph tells you the story of the game it depicts. What were the most important plays? Who was the MVP? Who was the goat? How improbable was the comeback? You can answer all of these questions with one interactive chart. It's as beautiful as it is elegant. Their work inspired the graphs I designed to chart World Series probability following every day of postseason play, but my charts couldn't do what FanGraphs' do... until now! With managing editor Dave Cameron's permission, I combined FanGraphs' play-by-play win probability data with my projected World Series probability numbers. 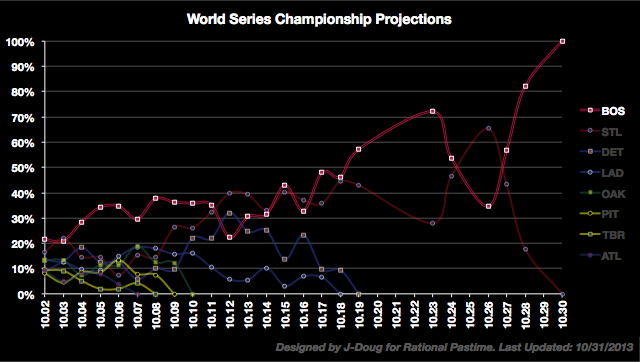 The result is the graph you see above, which charts the ups and downs of the 2013 World Series at the play level. But wait: there's more! Using the same data, I designed an interactive chart using Tableau Public, complete with leaderboards and a table of the Series' top fifty plays. Mouse-over the chart to get information about each team's chances following each play of this year's Fall Classic. So, what were the most important plays? Who deserved to be MVP? Who was the biggest goat? How close did the Cardinals come to winning it all, and how close did the Red Sox come to blowing it? Find out with my interactive chart below the jump. David Ortiz added the most World Series probability, but the biggest play of the World Series (by far) was Johnny Gomes' three-run dinger in Game 4. In and of itself, it accounted for about 1/6 of total World Series probability and pushed the Red Sox back over the 50% threshold.